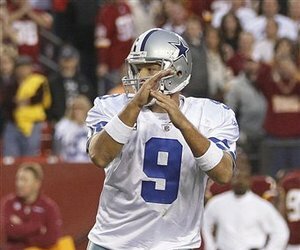 Things can change in a hurry in the league nicknamed “Not For Long.” Before Sunday, Tony Romo was tagged unlucky in the clutch and Vince Young was an immature brat, run out of Nashville like he was real country music. But dramatic road wins led by those supposed head cases have shaken up the NFC East in a good way. The 6-4 Cowboys, who’ve won three in a row since the Halloween Eve Massacre at the hands of the Eagles (34-7), are now tied for the division lead with the New York Giants. Three weeks ago that was as unthinkable as Joe Paterno getting fired (or the December 3 OU/OSU Bedlam Game having zero national championship implications). 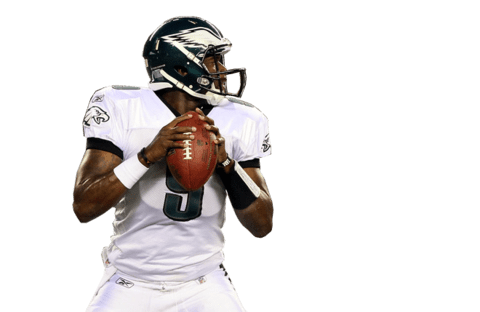 The Cowboys can thank a stoic performance by VY—always a Horn in our hearts—who overcame three interceptions to lead an 18-play drive in the 4th quarter that gave Philadelphia a 17-10 victory over New York. Making his first start for injured Michael Vick, Young converted six third downs on that heroic nine-minute drive, which even DeShowboat Jackson couldn’t bonehead away. Earlier in the day, Romo created huge plays and played gutsy, almost flawless football against the Washington Redskins—then almost blew it in overtime with a bad Chris Webber impression. Romo was set to hold a game-winning 39-yard field goal by rookie Dan Bailey when he saw the play clock at one second and jumped up and called for a timeout, even though the Cowboys had the same number of T.O.’s left as they did starting wide receivers called T.O. That would’ve been a five-yard penalty, except Skins coach Mike Shanahan, who won’t help the nation’s unemployment statistics at the end of the season, beat Romo by a blink to try and ice, ice Bailey. The kick was barely inside the right upright. From 44 yards it’s no good. Romo got lucky and, for once, a flashy blonde was not involved. It just feels different this year, doesn’t it? With a defensive coordinator who looks like the Bigger Lebowski, the Cowboys have been rolling on the Sabbath. Am I wrong? For offensive game-changers, Jerry Jones can be credited with making a great pair of bargain draft picks from the Big 12 in the past two years—WR Dez Bryant in 2010 and OU running back DeMarco Murray in the third round this year. Oklahoma State trouble man Bryant was deemed a risk and fell to No. 24 in the draft, but not wanting to pass on another Randy Moss, Jones said “character, schmaracter” and even gave Dez the vaunted No. 88. Romo, Murray and Bryant may not quite be the Triplets, Part II, but when you add TE Jason Witten, a healthy Miles Austin and RB Felix Jones, that’s an offense that can make downfield happen fast. The Cowboys biggest remaining games are both against the Giants: December 11 at home and January 1 at the Meadowlands. The Blue Man Team has lost to three teams the Cowboys have beat—Washington, Seattle and San Francisco—but that won’t mean much when these rivals pad up. If either New York or Dallas wins both of their matchups, there’s your NFC champs. If they split, the Cowboys have a slightly easier trip to the top, including Miami at home on Thursday. Thanks to a restraining order that keeps Leon Lett at least 100 yards from Thanksgiving games in Dallas against Miami, the Cowboys should go from 5-4 to 7-4 in five days. Dallas then plays the 3-7 Cardinals in Arizona December 4. 8-4? Meanwhile, Eli Manning’s crew goes to New Orleans Monday night, then hosts the Green Bay Packers December 4. 6-6? With Jay Cutler out for 6-8 weeks with a thumb injury that makes him throw like Tim Tebow, the 7-3 Bears’ season could be headed to 8-8. Cutler’s exit leaves the Detroit Lions, Atlanta Falcons and (trust me) the Philadelphia Eagles with the best legitimate shots at fighting the Dallas/New York also-ran for the two wildcard spots. The Packers, 49ers and Saints are in divisional charge. Three weeks ago, after Michael Vick beat them so bad he almost violated probation, the listless 3-4 Cowboys looked as likely in the playoff picture as Deion Sanders getting an Emmy. But now Romo’s in the driver’s seat and the Cowboys are looking at a nice stretch of open road. For Cowboys/ Longhorns fans, that doesn’t quite make up for the Kansas State loss, but with a former Longhorn helping the Cowboys, the weekend ended on an up stroke. This entry was posted on November 23, 2011 at 7:47 pm	and is filed under Uncategorized. You can follow any responses to this entry through the RSS 2.0 feed. You can leave a response, or trackback from your own site.